I like this better than the Bells IPA, there is a nice spice present. November 25, 2008 -- Mendocino Brewing Company announces the launch of its Limited Edition Winter Seasonal. This Limited Edition Imperial IPA has been delicately crafted for those crisp cool days when the skies are resplendent and the air glistens with the slow fall of a million flakes, when nature gets ready to turn her thermostat way down and your desire for something warm and enthusing is almost a primal urge.Our robust, full bodied IPA is brewed with massive amounts of hops and paired with a rich blend of luscious malts. The result is a perfect balance of heady hop flavor and aroma. At 7.5% Alc. By Vol. this India Pale Ale is the perfect winter seasonal! Mendocino Brewing Company is a pioneer in the American Craft Brewing Renaissance and has for over 25 years been brewing a range of ales that makes California proud. To herald the coming seasons you can expect coming your way a Spring Bock in the months to come. Alc. by Vol. : 7.0% - 210 cal. per 12oz. dark, coffee, nice amount of carbonation. for a stout. It seams as though the grains may have gotten a bit scorched, there seams to be a heavy caramel taste. Combine mash grains with 7.15 gallons water. Perform an protein rest at 128 degrees for 30 minutes using infusion. Perform an saccharification rest at 152 degrees for 45 minutes using infusion. Mashout at 175 degrees using direct_heat. 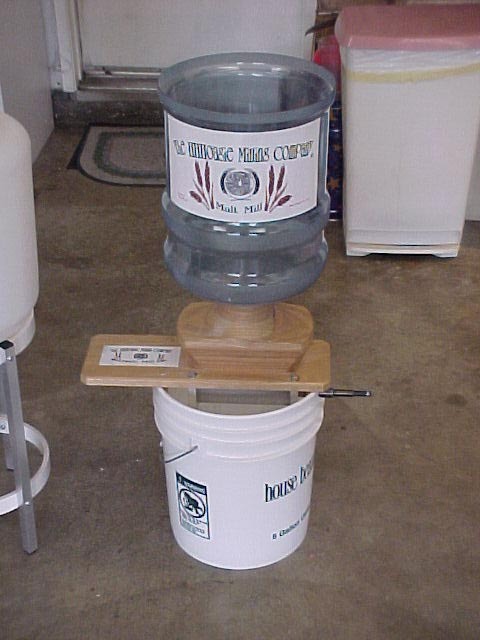 Sparge with 4.06 gallons of water. Run off 6.48 gallons of wort. Current volume should be around 6.48 gallons. Add hops per hop schedule. Add Irish Moss as appropriate. Total boil time is 1.00 hour(s) at which time the volume will be around 6.23 gallons. Cool wort and transfer 5.5 gallons to fermentor. When fermentation is complete, prime and bottle. Stainless....maybe it is possible and affordable? Flux is contained within the electrode. It provides shielding, deoxidization & arc stabilization. Additional shielding may be added. A smoke suction nozzle around the gun or fume hood aids in reduction of smoke & fumes. Aufhauser flux cored stainless steel wire is formulated to provide all position welding & smooth, stable arc action. mash water with calcium chloride, chalk (maybe play with water)?? 0.95 oz. Super Alpha Pellet 11.00 42.8 90 min. 0.88 oz. Pacifica- Pacific Hallertau Pellet 5.50 4.8 15 min. 2.12 oz. NZ Cascade Pellet 7.00 0.0 0 min. 1.76 oz. Pacifica- Pacific Hallertau Pellet 5.50 0.0 0 min. cost = one 6 pack from the first 5 brews. Now you just can't beat that! Thanks Marlin! We will put this to good use. there are different size tanks you can use for co2: 2.5, 5, 10, 15, 20, 50 lb, etc. but it turns out that at welding supply shops, the cost to fill a tank that is larger is usually only a few dollars more than for a tank half its size. so to fill a 50 lb tank, was less than twice the cost of a 2.5 lb tank, yet you get 20 times as much co2. the '#' sign and lb are interchangable, and the '#' is stamped on the tanks. when i say 'fill' i actually mean swap for most places. what this means is you take in your empty tank, and swap it for a full tank for the cost of the fill. you will lose your pretty new tank if you do this, but i bought all my tanks used anyway. also, if you didn't know, the tanks need to be hydrostatically tested at least every five years. this means the tank is filled with water to a certain pressure, and the integrity of the tank is measured (i believe they measure the expansion of the tank and contraction of the tank during and after the water to see the durability of the tank) plus they look for micro cracks that can develop around the valve. what this means to you though, is if you find a tank used (and i recommend you do! such as on craigslist or ebay - but check for shipping costs), always ask for the most current test date. if it is longer than five years, or close to five years, expect to pay for a hydrotest, and deduct that from what you are willing to pay for the tank. just so you know i bought almost all of my tanks for 20 dollars, and they were all out of test (i have a 50 lb, 3 x 20 lb, 2.5 lb, and used to have a 5 lb). so to get a full tank within test, cost me about 50-60 dollars a tank. WITH 20 COPPER JET TIPS AND 150,000 BTU. Boil water. You will need at least a gallon of sterile water for a variety of small tasks. Start by boiling about 1 gallon of water for 10 minutes and let it cool, covered, to room temperature. -Fill HOP SACK w/ pellets vs fresh and drop SACK w/ S.S. weights = to the weight of the pellets in to the beer. Good but not great. nice toasty oats flavor but seemed to be missing some body. Small Centrifugal magnetic drive pumps with DC motors. Centrifugal magnetic drive recirculation pumps for a range of OEM applications. Small regenerative turbine magnetic drive pumps manufactured from Ryton. Centrifugal magnetic drive pumps with encapsulated motors. Multistage magnetic drive pumps for mild liquid manufactured from acetal. Multistage magnetic drive pumps for aggressive liquids manufactured from polypropylene. Multistage magnetic drive pumps for mild liquids manufactured from polypropylene. Magnetically driven chemical transfer pumps manufactured from machined plastic ATEX rated. Regenerative turbine magnetic drive pumps manufactured from pp or PVDF (ATEX certified). High volume centrifugal magnetic drive pumps. ATEX certified centrifugal magnetic drive pumps manufactured from stainless steel. Regenerative turbine magnetic drive pumps manufactured from stainless steel and ATEX certified. A comprehensive range of centrifugal magnetic drive chemical transfer pumps. Vertical Pumps AS Industrial centrifugal column pumps.Penguin Seal-less centrifugal pumps.VSP Multistage centrifugal pumps for OEMs.VTP Turbine pumps for OEMs. Tank/Pump Systems ABF Condensate removal tank/pumps.CC Condensate removal tank/pumps.HC Hot condensate removal tank/pumps.Low boy Low profile condensate removal tank/pumps.TCP-25 Condensate removal tank/pumps. The basics of "How to Brew"
I have never welded and it takes too much equipment that I don't have. Too expensive. I will just have to be creative for now. HFC-35-NSF SeriesHigh flow polysulfone. Higher temperature and pressure quick disconnect with 3/8" flow path for minimal pressure drop. Hose barb ends for 3/8", 1/2" and 3/4" tubing. Is it possible to weld ?? I am really interested in what it takes to weld a nice brutus type set-up. I have been looking in to internet to see what I can find. Here is a good source of welding knowledge I will share with you.